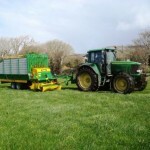 The Belmac-Conor O-Grazer is the latest grassland management tool on the Irish market. It is designed to greatly improve farm efficiency, profitability and to reduce costs. Increased return from your grass as it eliminates all poaching and cow fouling done to your paddocks by the cows while grazing. Provides an excellent buffer feed and animal’s energy is saved for milk production. Nitrogen usage is decreased and slurry usage is improved. It greatly improves grass utilization when weather conditions deteriote and cows have to remain housed. The O-Grazer causes very little damage compared to a herd of cattle. It has 4 off-set flotation tyres which cause minimal soil compaction and improve re-growth in all conditions. It solves the problem of having a fragmented farm, rather than bringing the cows to the grass you can bring the grass to the cows. Improved grass growth due to clean cutting of the drum mower and it eliminates the need for topping. Grazing periods can be extended at the beginning or the end of the season. body condition of cows is improved and it is more consistent which is vital during calving. It is also an ideal tool for conditioning bull beef. 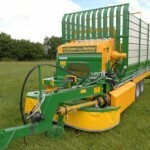 One of the O-Grazer’s main benefits is its ability to reduce costs. It promotes better grassland management which leads to an increased volume of grass for feed. 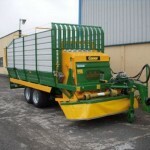 This reduces the volume of silage and other foodstuffs required. Fresh grass is the cheapest and best for of feed. The O-Grazer is specifically designed for Irish conditions, it is ideal for spring calving and liquid milk producers. The machine is available as a mechancial machine or a hydraulically operated machine. The hydraulic version has aconveyor belt at the rear for discharging the grass to one side and the rear door is hydrualically operated. The rotary cutting bar has two drums that oscillate independently of the chassis. 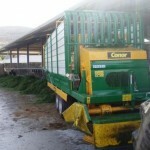 Its height can be adjusted to ensure perfect cutting of any type of fodder even over uneven ground. It has a low horse power requirement of 60 HP.